High quality laser/LED hybrid lamp-free tech offers 4,000 lumens high brightness, tempered by lower total cost of ownership (eliminating lamp costs, lamp replacement labor costs, and filters). Remote control of the PC and projector by smartphone or tablet enables teachers to project the screens they want to show from anywhere in the classroom, including the ability to display up to four student’s PCs at once. One Click Connection and other education solution features adds to the convenience. This interactive ultra short throw projector carries a more affordable initial layout being a lamp-based option, rather than SSI (Solid State light engine). It still features multi-point interactivity, allowing multiple students to draw with pen and finger and can save a session to share with parents or use as study guide and its 3800 color and white lumens will cut through ambient light. Teachers can use the iProjection app in the classroom to easily share and control content from up to 4 connected devices simultaneously. 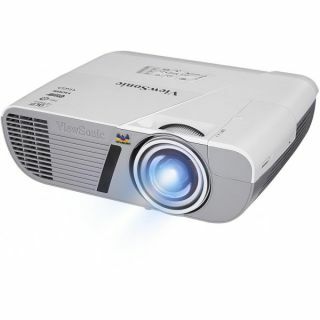 Equipped with a 10-watt speaker and TouchBEAM interactive touch tech, this projector includes a PC-free USB media player to support video, audio, image, and presentation files shared from any USB device in the classroom. Compatibility with both Windows and OS X offers flexibility, while laser phosphor tech offers 3,200 lumens displaying a 115” field from a distance of just 19”.